Knowing which way is up or down is important for all living things. For plants, which grow roots into the soil and flowers above ground, getting this polarization wrong would cause a whole host of problems. In plants, polarization of the entire organism depends on every single cell being polarized. Cell division, however, disrupts polarization. How polarity is reestablished was previously unknown. Now, researchers at the Institute of Science and Technology Austria (IST Austria) have solved one piece of the puzzle: They found that plant cells inherit the knowledge of up and down from the mother cell. The study, led by Jiří Friml, professor at the Institute of Science and Technology Austria (IST Austria), Matouš Glanc, Ph.D. student in the Friml group, and Matyáš Fendrych, previously a postdoc in the Friml group and now assistant professor at Charles University in Prague, is published today in Nature Plants. The directional transport of the hormone auxin sets up polarization in plants, but this transport in turn depends on the polar distribution of PIN auxin transporters in each cell. This means that every single cell has to be polarly organized for the plant to distinguish up from down. Cell division, however, sets a challenge: At each division, trafficking of polar membrane proteins, such as PIN auxin transporters, is redirected to both newly formed membranes. Therefore, the PIN auxin transporter polarity is lost in one of the daughter cells after each division. How correct polarity is set up again was unknown. Using a new transgenic Arabidopsis plant line in which fluorescent PIN auxin transporters can be followed exclusively in dividing cells, the researchers followed in real time what happens to PIN proteins and their polarity during cell division. What they found was surprising, says first author Matouš Glanc. "We thought that cells would need to communicate with their neighbors to correctly re-establish polarity. So we first looked for a signal that would be sent between cells. But we found no such thing. Instead, we found that polarity is communicated by the mother cell." Exactly how mother cells communicate up and down to daughter cells is not yet known, Glanc adds. 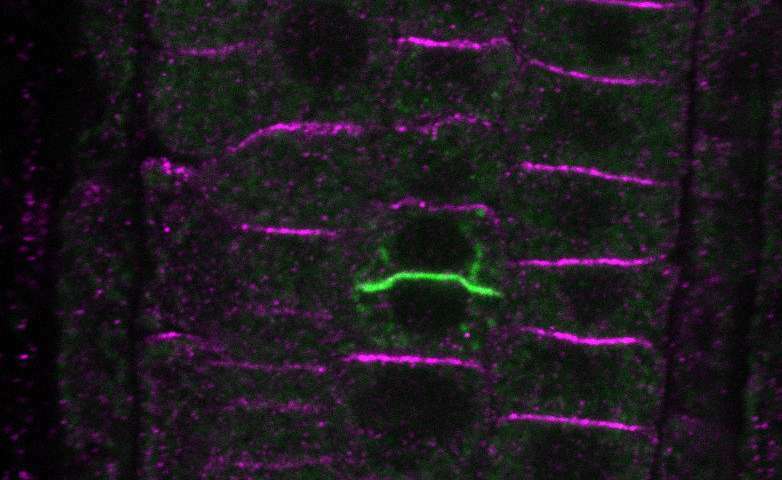 "We know that polarity information is not conveyed by signaling from neighbors, but is inherited from the mother cell—we are still trying to understand how." The researchers also found that endocytosis, which removes proteins from the cell surface, is crucial for this polarity re-establishment. Previously, it was thought that PIN auxin transporters that end up on the "wrong" cell side after division get removed by endocytosis and shuttled to the correct side. In the paper, the researchers show that instead of being ferried around, the wrongly placed transporters are endocytosed and destroyed. New PIN transporters are made and inserted in the correct side of the cell membrane. A group of kinases, PINOID and its homologues WAG1 and WAG2, modify PIN transporters through a chemical reaction called phosphorylation, and are also crucial for determining their polarity. Plants in which all three kinases are no longer functional are unable to re-establish polarity after cell division. In these mutants, we see what happens when plants get polarity wrong: The roots don't grow down into the soil along gravity, but wave and turn instead. While the study has provided some crucial answers as to how polarity is re-established, more questions remain open, says Glanc. "We have identified endocytosis and phosphorylation as key steps in polarity establishment, and we have shown that polarity is inherited from the mother. But we still need to find the nature of the inherited information. It is something inherent to the cells, but what protein, lipid or sugar is involved remains to be seen."